Willy is the Nintari Champion! Well, this is it. We’ve reached the end of the line for Willy Beamish. 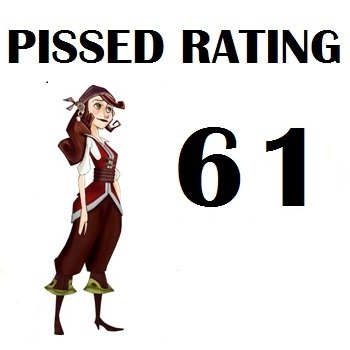 Ten gameplay posts and one “Request for Assistance” later, it’s just about time to discuss how the game did on our PISSED rating scale. Are you excited? I know I am. I never know how these are going to go before I start writing. But before we get to that, I want to quickly discuss two more things: the hint book and the Sega CD release. Some reviewers (like our friend the CRPGAddict) are awesome at finding contemporaneous reviews of games, talking about what others thought, and even coming to understand the likes and dislikes of the game journalists of the past. That’s not me. No, I have a different fetish: hint books. I first found and reviewed the hint book to Space Quest IV in large part because it’s featured in the game itself. Since then, I have been inspired to track down guides to the Scott Adams games, as well as a few more for games I might review in the future. They say everyone needs a hobby! Despite the Dynamix logo, this is very much a Sierra-style hint book, similar to the one we looked at for Space Quest IV. It features an introduction section with concept art and information about the game’s inspirations followed by a tip section using the “little red window” method. The end of the book contains maps of all of the areas as well as lists of every item you can pick up. If you aren’t familiar with this style, you can read more about it in my look at the Space Quest IV guide. Early concept art for Willy. The little bits of history the book provides is insightful, though probably biased. This was the third Dynamic adventure game (we ended up playing the 1991 games out of order), and for this one Jeff Tunnell wanted to aim a bit higher: an interactive cartoon. To that end, he hired Sheri Wheeler, an animator formerly with Disney and Filmation, to bring this idea to light. 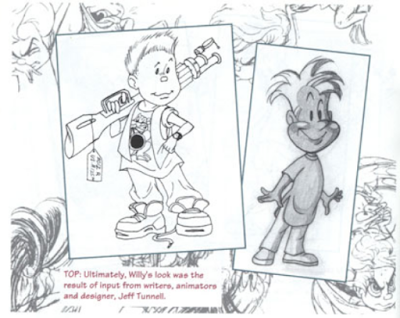 In creating the game, they utilized traditional techniques to storyboard the scenes more like how a cartoon would be done than an adventure game. You can tell where they hit obstacles-- unlike Sierra games of the period, you can’t freely walk around rooms-- but overall the effect is pretty nice. If you don’t feel like going to eBay like I did, some kind soul has scanned the whole book for your enjoyment. The correct solution to escape Spider on the first day was to give him the Gamebuddy. I suspected as much since you never found another use for it later in the game. Failing to use the iodine on your finger when you cut it will result in a “sports injury” that will prevent Willy from playing Nintari as well as he should. If only we could try homeopathy. The mystery item that Perry wanted to trade for a baseball card was Tiffany’s diary. We could then use this to get onto the ferry, instead of stealing a token from the fountain. It’s a nice example of an alternate solution. You can still win if you don’t convince Dana to let Gigi run in the race, but it will be more difficult. There is no way to win at the frog jump without cheating; you cannot “train” Horny in time to beat Turbofrog no matter what you do. The hint book does not seem to cover every possible solution to every puzzle, so there may be other things that I missed as well. My 2-year old recently stumbled on my collection of “frisbees” like this one. For this review, I played the 1991 MS-DOS edition. 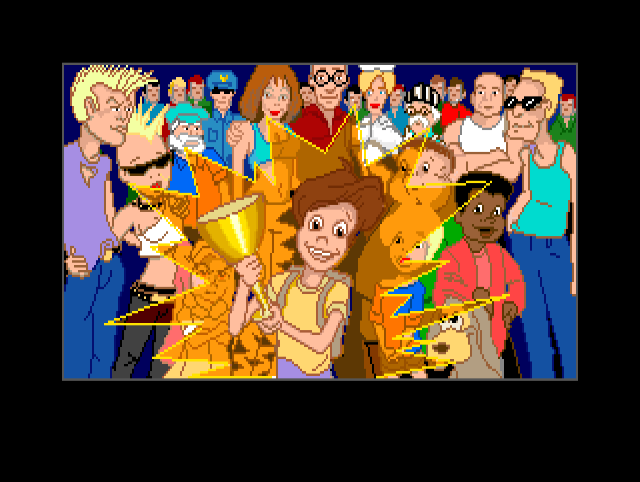 In 1993, the game was upgraded with voice acting and released both for the Sega CD and an expanded DOS version. I know at least that the Sega CD version included some additional animation, a redone introduction sequence, and some other interface changes to better accommodate the limited controls of a console. If the internet is to be believed, they also added extremely long load times. They also “fixed” one of my complaints of this playthrough by making the Nintari a playable minigame. Unfortunately, they swapped out the insane-looking Mario clone with a something akin to Space Invaders (1978) with a side of Doctor Mario (1990). Cool. But not as cool as I’d hoped. I didn’t play the game myself, but from what I can tell watching Let’s Play videos, you have to shoot the blocks that come down. If you miss, they start to fill up the screen until they reach the top and “game over”. Beyond that, the other major feature of the Sega CD edition is the voice acting. I only watched a few minutes, but from what I saw it was pretty mixed. If you played one the versions that had voice acting, please let me know what you thought in the comments. Let’s start with the good stuff: most of the puzzles in this game are “good” or “great”. There is a lot of creative use of inventory and, more importantly, a handful of puzzles with alternate solutions. At least one of the puzzles is optional, but simplifies a later sequence (if you fail to convince Dana to join the competition, it is still possible for Willy to win), and the ending can differ a bit depending on which puzzles you solved. In almost every case, the puzzles fit well into the story and rarely played against the overall tone of the game. Yes, some of them were quite silly, but that’s what the game was aiming for. My favorite puzzle of the game. Less good are the timing puzzles. This game is constantly pushing you forward, from the very first day when you have to get home from detention as quickly as possible, to the last when you have to rescue your father; the clock is ticking. I died dozens of times, a very good number of them because I didn’t have enough time to explore and smell the roses or because you can only try one or two thing before the timer runs out. I had to replay portions of the game multiple times to try to save as many minutes as possible so that I could do everything that I needed to do. I think that the time requirements were supposed to give you a feeling of urgency, but all I felt was annoyed. The game would have been better off without this mechanic at all. I also felt that a few of the puzzles turned into brute-force, trying random things until something works. The worst example of this was escaping the Tootsweet security guard: you had to attach the Nintari key to the dog-tag chain to hypnotize the security guard. 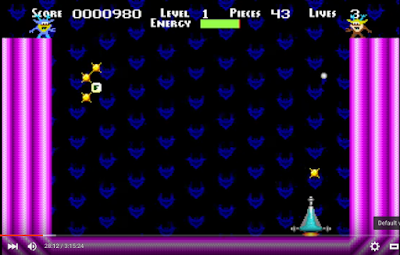 You would never do those actions except in exasperation; I barely figured it out after hours of banging my head against the game. All my frustrations aside, there were some fun puzzles here. Having multiple solutions and optional puzzles was a great touch, weighed down only by the annoyance of too many time-based limitations. 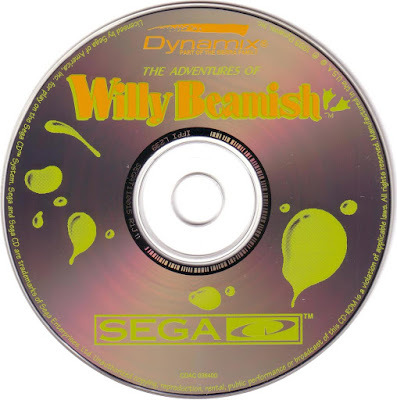 Willy Beamish has a fine user interface, but one that showed a lack of polish and consistency. It is simpler than most others of the time period: you only have two (occasionally three) options which you can choose between by right-clicking, plus inventory items. Using the magnifying glass pointer works as “look”, while the arrow works for just about everything else and will change depending on context. For example, mouse the action cursor over a person and it might change to a dialog balloon. It’s a flexible system, but there are some strange inconsistencies. When you are using the action cursor, for example, you can press “tab” to cycle through things you can interact with. No other cursor offers this functionality so it can be difficult to know what you can look at or interact with using inventory items. For example, it took me longer than it should have while battling the vampire to realize that you needed to use the mouse on the coffee table because there was no “tab” stop there. A full inventory screen. Note the identical “>” buttons at the top and bottom. Even the inventory management screen shows a lack of consistency. Want to use an item? Click on it then mouse out of the inventory screen. Don’t want to use an item? Mousing out does nothing, you have to hit the “exit” button. 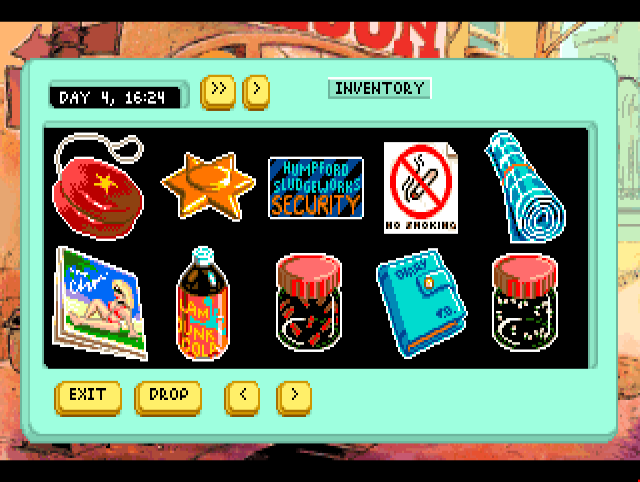 I also had a nasty habit of pressing the “move time forward” button when I wanted to scroll the inventory screen, rather than the identical button at the bottom of the screen. None of these are showstoppers, but they demonstrate a lack of polish. This game engine is simpler and less-polished than Sierra’s engine, but a big improvement over their efforts in Rise of the Dragon. The minimalism works well for this type of game and having an interface that stays out of your way is always nice. We’ve been mostly giving 7s to the Sierra “SCI1” games of this generation and it’s not quite there, so let’s leave this category as a 6. Very close to a seven, but not quite. Workin’ at the carwash blues. 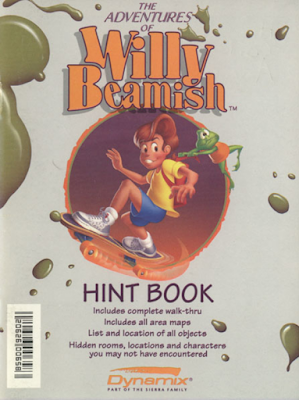 Willy Beamish plays out on two levels. On one hand, it is a simple cartoon-like story that you should not think much about. Leona Humpford’s master plan falls on a second glance, stretched as it is over an implausible condition in her late husband’s will. Willy barely even cares about her evil schemes, except in the ways that they overlap with his desire to get to the Nintari championship. Only when his father or frog are put in danger, does he go up against her directly. The evening side-adventures with the babysitter on day two and the ninjas on day three have little connection to the overall plot, although they are pretty fun on their own. 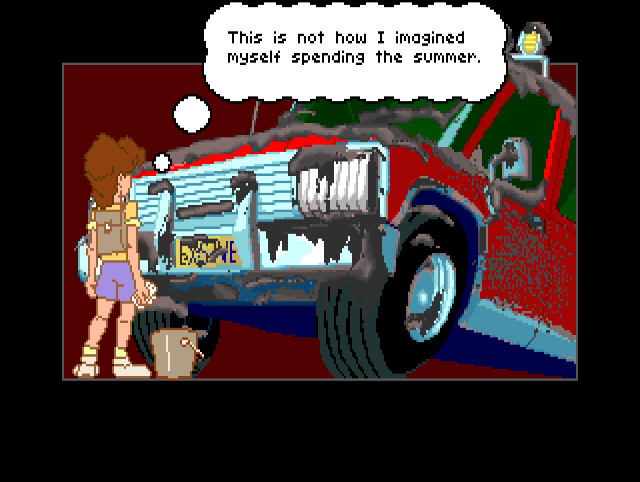 As adventure game plots go, this is passable and there was nothing here that I didn’t enjoy. And yet, it wasn’t for nothing that this is the first game we’ve played (that I know of) with “screenwriter” credits. There are some very well-done plot beats, especially as we neared the end of the game. The scene with Turbofrog rescuing us is still one of my favorites. But the story is also well-structured. Did you notice that Willy’s dad has a plot arc almost as important as his son’s? We see a father figure that starts at a low point after losing his job, begins to recover when he finds a new one, but then he is offered a choice: he can do the right thing or the safe thing. He picks the right thing, even though it places him and his family in danger. 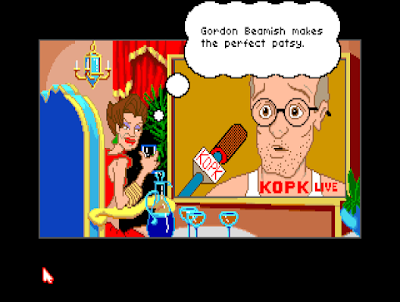 The scene where Gordon reveals Leona’s wrongdoing to the press is a fantastic one and the very fact that we care about the off-screen actions of a secondary character is a rarity in adventure games. 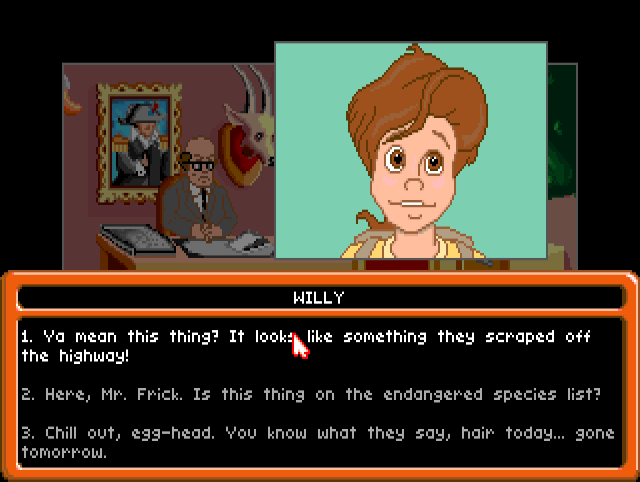 Even without the crisis, there are a few nice connection points between Willy and his father throughout the game. I love the little pep talk that Willy tries to give his dad while they are playing with trains. I love that Gordon looks in on his son every night after he is asleep. Those moments aren’t required to solve any puzzle, but they made the story richer. Willy and Gordon’s two plot arcs finally converge at the climax of the game. After he is rescued, Gordon tells his son how proud he is of him. That moment, as important as any Nintari championship, only works because of how well the relationship and their parallel development was built up over the course of the game. The real hero of our story? Although this is Willy’s and Gordon’s story, you can see some of the same depth applied to other characters. Willy and his younger sister clearly love each other, though neither want to admit it. (I also love that she speaks French; a cute character moment that has no bearing later.) Tiffany’s mini-arc is a bit of a misfire and I do not buy that she can go from valley girl to punk chick over an afternoon; I especially was disappointed that Willy’s manipulation of her scale doesn’t seem to have affected more than a one-off cutscene. Dana is caught between being a tomboy and starting to do more “girly” things, and Willy is equally unsure how to behave around her all of the time. Even Ray, the bouncer, is deeper than he looks with his strange affection for new-age mumbo jumbo thanks to the influence of his new girlfriend. There’s some good work imparting these shades of characterization in the limited text and animation that we have. I can hear the howls of “but the plot doesn’t make sense!” already, but I inhabited this game for many hours of play time and multiple playthroughs. As I finished, I was still finding cute character moments and little bits of description that make the plot and setting come together. Perhaps because I am a father on my way (eventually) to 40, I especially like Gordon’s arc and the rich way that the family was depicted. It is not perfect by any means, especially as the Nintari championships become nothing more than a MacGuffin. But what I saw, I liked. 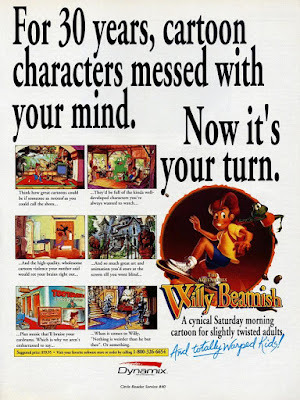 It wasn’t for nothing that Jeff Tunnell and his team billed Willy Beamish as an “interactive cartoon”. 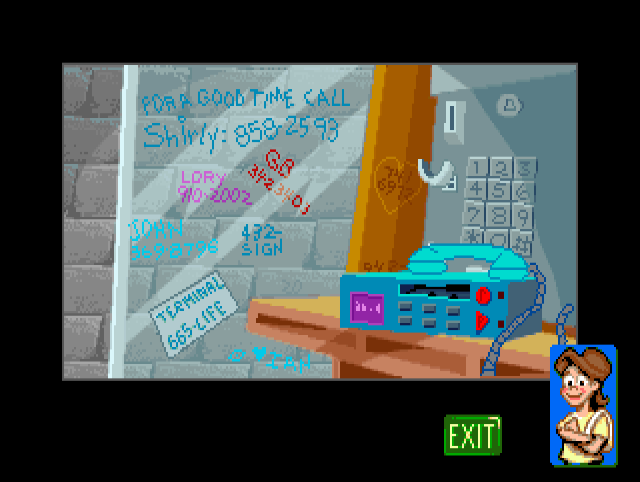 The graphics for this game are extremely good for 1991 and hold up even today. The watercolor backgrounds almost always pop and a ton of attention was paid to inconsequential animations. Willy’s walk style changes with different scenes, there are frequently little transitional animations or other things going on in the background, and they avoid the disjointed feeling present in other games where motion-capture meets static backgrounds. That said, there are strange gaps. A few of the mouths seem to be a particular challenge for the artists, almost like they were inked on after the production sketches were done. 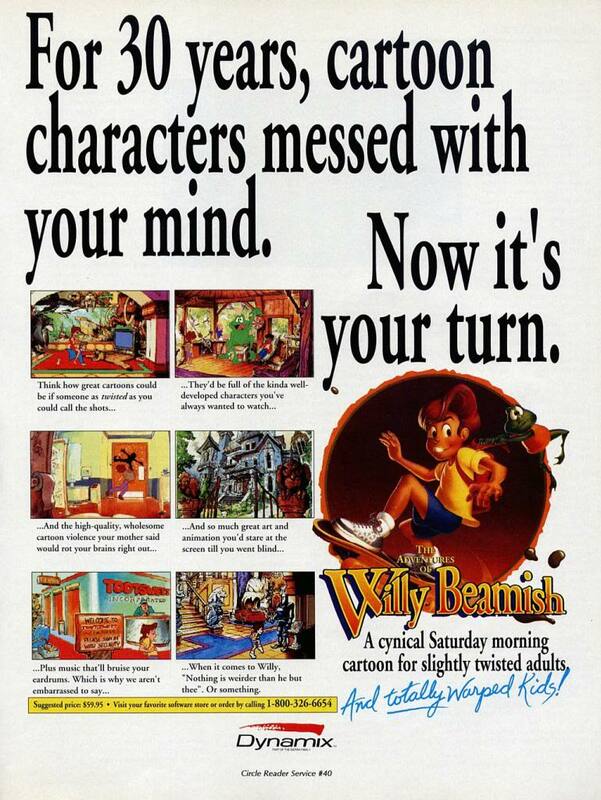 Full page ad for “Willy Beamish”. The game’s sound is pretty good, but few of the songs pass the “hum” test. Despite playing this game a great deal, there are only a few bits of background music that I can hear in my head. It’s never intrusive, but also doesn’t quite make an impact either. The sound effects are overall pretty weak, although that could be one or two very badly sampled sounds overshadowing the others. Chef Childish’s screams are still among the worst noises ever to play out of my computer speakers. I’m going with a high rating for the graphics (some of the nicest we’ve seen), but the game music and sound effects really didn’t do it for me. When rating this category, I always like to think about how the game makes me feel rather than individual scenes. I have said a lot about characters and setting already-- and there was so much that I loved-- but all the same the “atmosphere” was occasionally just a bit derivative. For all that their advertisements touted the game as being reflective of “30 years” of cartoons, mostly the game felt like they were trying to channel The Simpsons. I can’t put my finger on why I don’t like the atmosphere more, when I clearly liked the character work and story depth, but there it is. Too much of the early game was multiple choice. We are getting closer to the day when this category will refer to voice acting, but for my playthrough I stuck with the voiceless 1991 edition of the game. I think I’ve talked your ear off already about the story to this game, much of which is imparted through well-written dialog giving consistent voices to the characters. I have difficulty looking a specific piece of dialog that I loved, but there was a lot here to like. I eventually came to enjoy the “choose your own adventure” dialog options, but too many of the choices were either obviously wrong or led to certain death. I think it also helps the “dialog” that the character portraits are so expressive. Rather than one or two, Willy had many individual portraits for different conversations. Other characters had fewer, but many had more than one. These extra portraits during dialog scenes helped to set the tone. It’s not a huge thing, but I think it helped. Let’s tally up the points: 5+6+7+7+6+7/.6 = 63! But before we get too comfortable with that, I want to make two adjustments. First, minus one more point for the timing puzzles. So much of what I liked about the game was in spite of, not because of, the timing puzzles and I cannot help put subtract just a bit more for them. Second, minus another point for reusing animation during the winning scene. I just beat the game AND won the Nintari Championship, Dynamix could have done better than to recycle the same animation from the game’s introduction movie. That leaves a final total of 61, higher than most of you guessed. The average guess was 50 and Laertes managed to get the score on the nose. Congratulations! I had a lot of fun with this one. I was 13 when this game came out and probably would have enjoyed it, though with more than a bit of the humor going over my head. 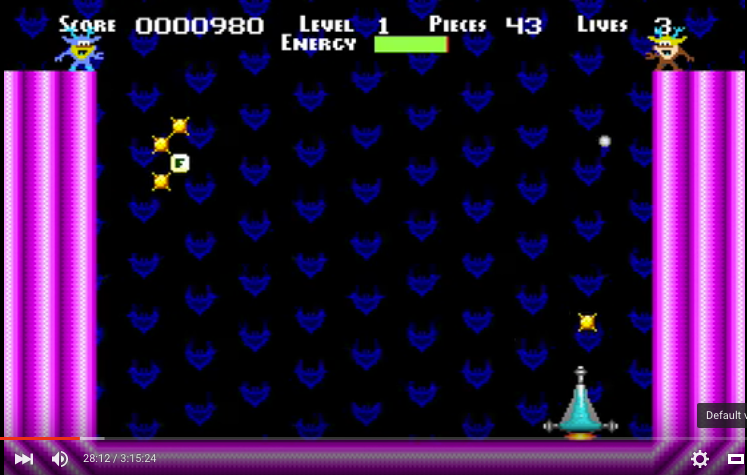 It’s not quite a lost and underappreciated classic, but it is a great effort and it’s a shame that Dynamix did not build on this success more. My next game game from the big list will be Cruise for a Corpse, but I have one or two tricks up my sleeve before then. And YES, the final Questprobe post will be coming very soon. I swear. See you soon! True Companion Award – 10 CAPs - for keeping Joe company by playing through Willy Beamish with him. Psychic Prediction Award – 10 CAPs - for correctly guessing the final rating of the game. Complimentary Corkage Award – 5 CAPs - for correctly guessing that the thing at the bottom of the aquarium was a cork rather than a button, as Joe suspected. 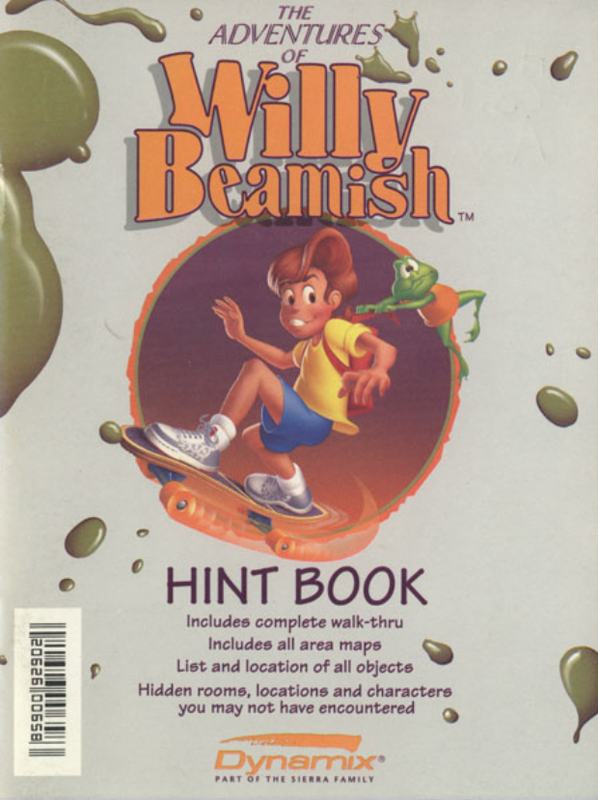 In the meantime, note that Willy Beamish has risen to the top 10 adventure game list, dropping the remake of first Space Quest from the list. Funny that a game which features misspelled versions of "Nintendo" and "Gameboy" got picked up for the SegaCD. Almost surprised they didn't ask for them to change those references to Sega products! They did! The Sega CD version of the "Gamebuddy" is more like a Sega Game Gear. But I believe they kept the name "Nintari". In the immortal words of Jean-Luc Picard - CAP distribution and leaderboard updated! Was that in the episode when Picard became a borg? Are you sure I suggested using TAB? I don't remember it. Oops. It was actually Laukku. I find it rather funny that I ask a question, answer it myself and get CAP for it. Based on your posts and the sense I got of your overall enjoyment despite the game's flaws, 61 seems like a very fair score.